Shahi Atte Ka Halwa is a scrumptious and delightfully delicious classic sweet dish ( dessert ) brimming with richness. It's just simply divine! It can be prepared and consumed on so many festivals and get togethers. 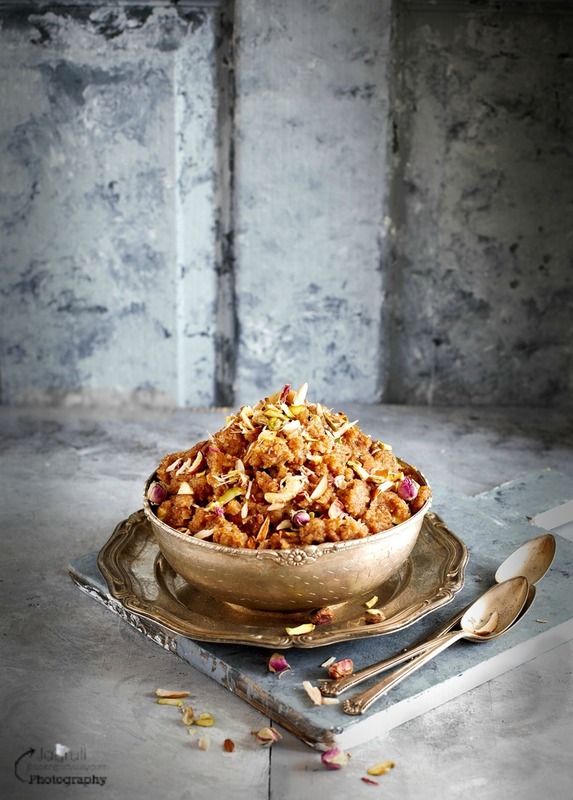 This yummy dish is made of whole wheat flour, ghee, sugar, nuts and Khoya ( Indian milk solids ). 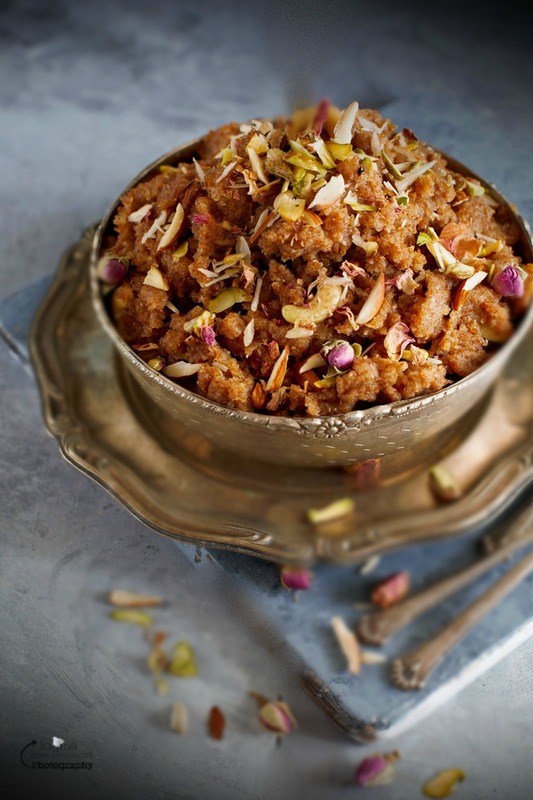 Atte Ka Halwa is a classic sweet dish that is a very popular speciality in North India. To make atte ka halwa, obviously you need basic ingredients, but on top of that you will require lots of patience, love and care. You can not prepare atte ka halwa in a hurry. If you make it in a hurry result will be sticky and raw and the taste will be awful. You need to roast Whole wheat flour ( chapatti flour ) in lots of ghee on a very low heat until flour turns nice and brown ( not burnt ) and not only your house but your next door neighbour's nose feels up with it's divine aroma:) Only well roasted flour adds that delicious flavour and gives khasta ( flaky) texture to the Halwa. My mum hardly made Semolina or Sooji ka Halwa, unless there was a Shri Satynarayan Puja performed in our family. 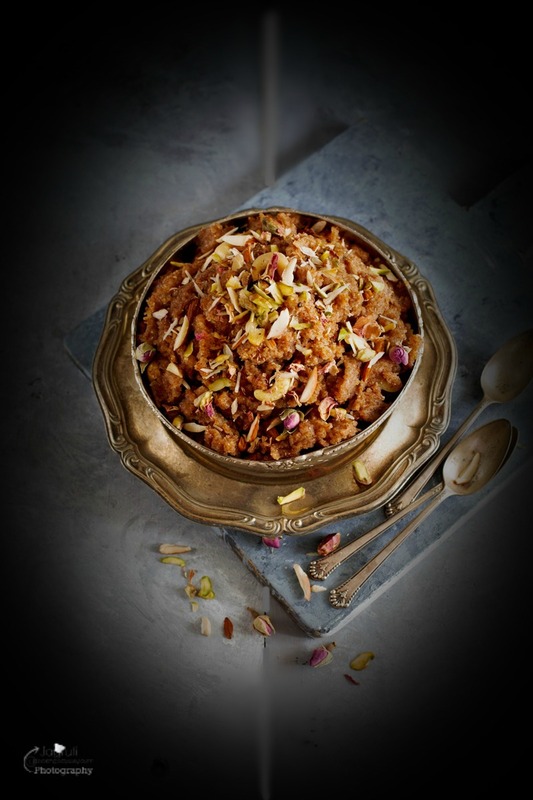 She was fond of making proper atte ka halwa and that too with Khoya, The addition of the Khoya and generous amount of Nuts lends so much richness to this dessert. Normally atte ka halwa is made without Khoya. Atte Ka Halwa, can be prepared anytime, some people love to devour this on an ordinary day at breakfast time, but mostly this dessert is prepared and offered as prasad to deities on religious festivals like Raksha bandhan, on Asthami and Navmi feast during Navratri, Ganesh Chaturthi, Bhaidooj and many more. Or simply serve as a Shahi dessert after having traditional or exotic Indian meal, believe me this sweet dish makes you feel that you belong to a royal family !! Now that the Indian festival season is in full swing, there are so many upcoming occasions that are waiting for you to celebrate. There will be so much to indulge in - mainly rich and scrumptious Desserts or Indian sweets. Now a days I prepare traditional Indian dishes, so my kids and family can have a taste of my childhood and allow me to relive it at the same time! Shahi Atte Ka Halwa is a rich, scrumptious and delightful classic sweet dish ( dessert ) and can be prepare and consumed on so many festivals and get together. 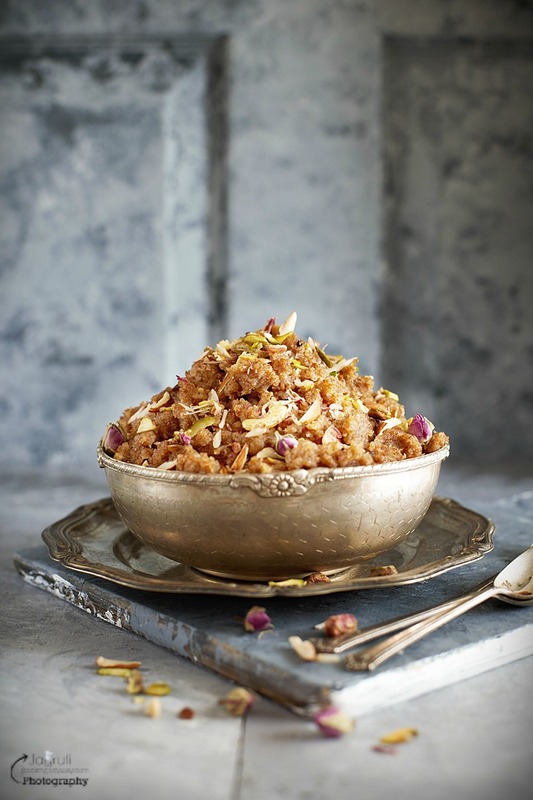 This yummy dish is made of whole wheat flour, ghee, sugar, nuts and Khoya ( Indian milk solids ). In a heavy botton kadai, gently roast the khoya for 5-6 minutes. Remove it from the kadai and keep it aside for later use. Now heat the ghee in a kadai and add flour. Saute the flour on a low to medium heat for good 15-18 minutes or until flour turns brown, ghee separates from the flour and your kitchen fills up with incredible roasting aroma. Once ghee separates from the flour that indicates that your flour is well roasted and it is ready for the next step. Meanwhile boil 1 cup water and leave it aside.Gently and slowly pour boiling water into roasted flour, keep stirring same time. Once all the water dries up, add sugar and keep mixing for couple of minutes. Add fried khoya, and mix well until you see Halwa separates ghee once again. Add cardamom and nutmeg powder and mix well. 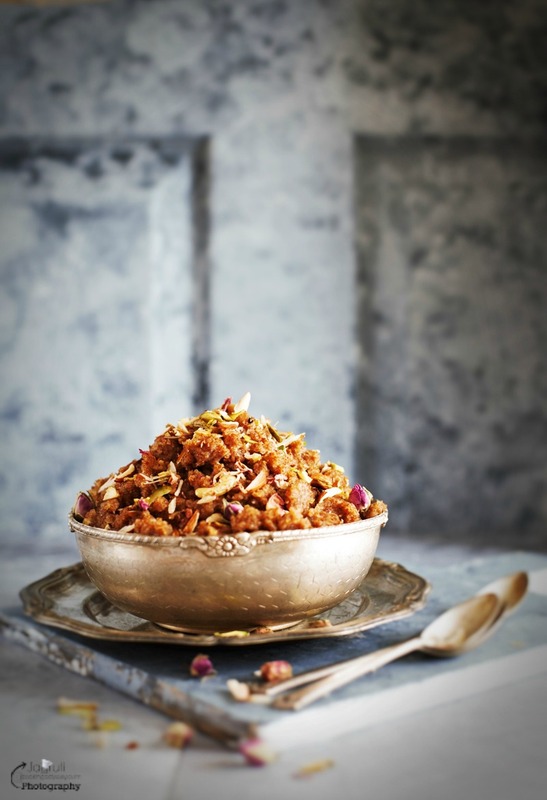 Garnish it with the finely chopped nuts and edible flowers and serve. If you are offering as a prasad, don't forget to put holy basil ( Tulsi patta ) on top of the Atta Ka Halwa prasad. Very interesting seeing recipes from other cultures! Where do you get the Indian spices from? Thanks Lisa for lovely comment. I reside in the UK and we get all the Indian spices here everywhere, even you can buy them in British supermarket too. What an interesting recipe! I've never had this, but it looks like something I'd love to try. I can only imagine how fragrant the whole wheat flour is as it's toasting! A new recipe for me as well! Your photo's are beautiful! Thank you laughingspatula for the lovely words. Hi Jagruti, I have not heard of Shahi Atte Ka Halwa but would love to try it! With the roasted wholewheat, cardamom, nutmeg and mixed nuts it sounds so delicious!